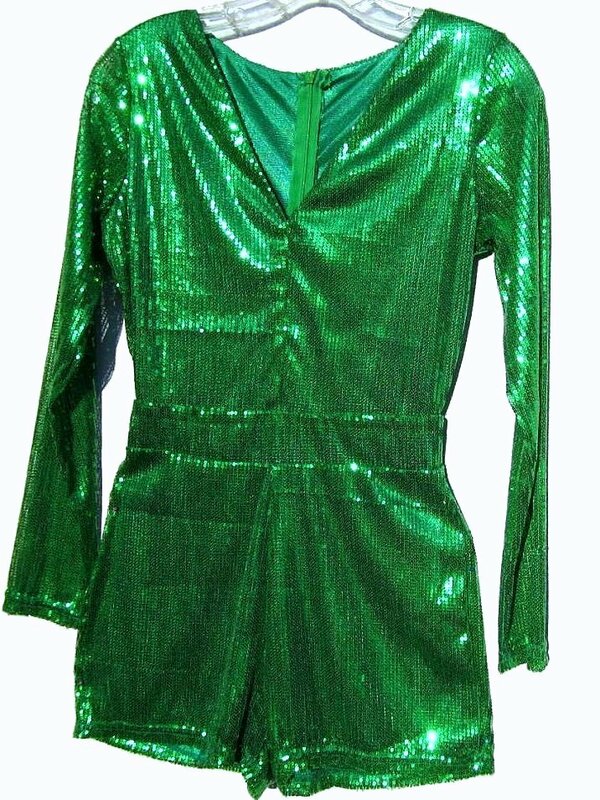 This is a dazzling kelly green one piece hotpants outfit. It is made with real sequins that reflect an iridescent lime green color. The sequin overlay is lined with a thin green lining. Both have a slight stretch. The outfit is hand washable! Hang or dry flat. They are a little larger in the chest than in the hips. The chest is approximately a size 2/4 and the hips are around a 2. The chest is 33 1/2" around and will stretch up to 35" or 36". The hips are a mere 31" and will stretch up to 33" or 34". Sale is final between 10/08 - 12/29. Sequin Mesh Overlay, Thin synthetic smooth fabric underneath.